The rest of the story goes like this: after Julita and Leonard Jones lost their Laguna Beach home, as well as their extensive art collection and life work, in a fire, they moved into a temporary home in Laguna Canyon. A few months later that was hit by a 100 year flood that inundated the area. Now, finally, they are building their new house, modeled after the old one, on their property in Laguna Beach. I shot this photo of Julita checking in on the construction site, in the same spot where the other photo was taken, a week ago. “Printmaker Julita Jones lost her Arroyo Chico home to a fire last summer along with most of her own art and a sizable personal art collection. Flooding in Laguna Canyon dealt her a second blow. Jones had stored a number of works with fellow artist Marsh Scott, a metal sculptor whose studio was destroyed by flooding. “We still have our lives,” said Jones, undaunted. 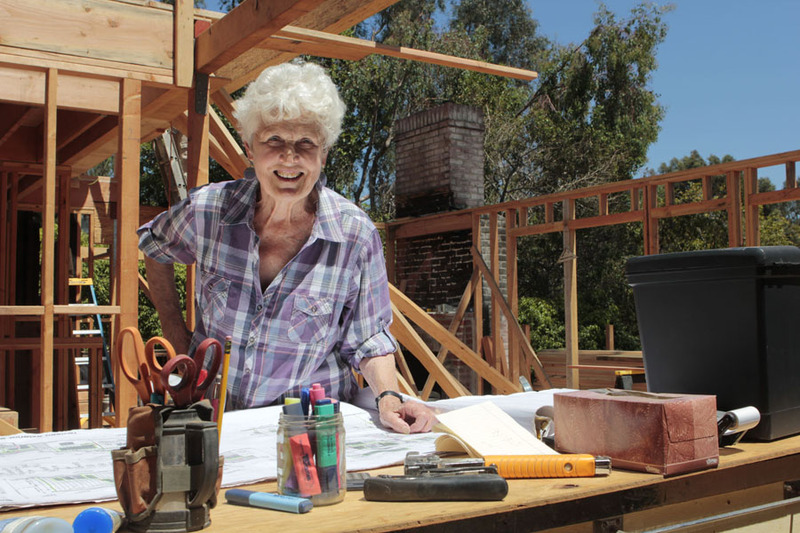 She and husband Leonard are rebuilding their house on the same tree-lined street. “It’s in the framing stage now, but we are still trying to figure out everything we lost for the insurance,” she said.